"All of our different modalities transfer images to the device and each time, the CD comes out error-free." There is little debate in healthcare that the portability of patient images and information improves the patient care process. Yet, timely and cost-effective delivery of radiology images and reports is not always as easy as it may seem. 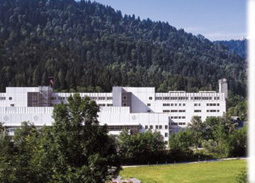 At Klinikum Garmisch-Partenkirchen, the 505-bed teaching hospital of the Ludwig-Maximilians-University ( Munich, Germany), the radiology department does not have a PACS for electronic distribution of images outside the hospital, further complicating this process. Christian Gärtner, M.D., Chief of the CT-MRI Department, realized that while the facility's current film printing solution works well for primary diagnosis, what they really wanted was a digital solution for distributing patient images to referring physicians or when transferring patients. He also knew that the hospital was several years out from purchasing a PACS. In late 2006, he began searching for a CD/DVD burner solution that would solve his immediate needs and also be compatible with any future technology investments such as PACS and RIS. 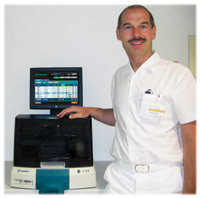 While at the German Radiology Society annual meeting in early 2007, Dr. Gärtner looked at the different CD burner technology and was intrigued by the Virtua© Medical Disc Publisher from Codonics (Middleburg Hts., Ohio). "Virtua is one unit with a touchscreen display - no mouse or additional devices and very compact," he says. Dr. Gärtner soon discovered that Virtua prints up to 60 CDs or 30 DVDs an hour. With high-field MRI and multi-slice CT at Klinikum, he knew right away that this was the right product for his facility. Part of what makes Virtua a winning solution at Klinikum is the ability of the device to connect directly to a variety of imaging modalities. "All of our different modalities transfer images to the device and each time, the CD comes out error-free." Dr. Gärtner's prior experience with a CD burner was not the same. At another hospital where he worked prior to Klinikum, there were frequent errors that remained unsolved throughout his tenure.
" With Virtua, there are no hardware failures and it is easy to use without much training or experience." Codonics was one of the first companies to provide a CD/DVD burner that conforms to the DICOM standard. By using this open standard from the beginning, Codonics enabled patients and physicians to view images on virtually any platform. The added benefit is that other healthcare facilities can download those DICOM images directly into their PACS. He also finds the device simple to connect to the modalities. "Everything I need to configure a modality is on one USB device," Dr. Gärtner says, "and I don't have to customize any software." This even includes the German interface. In fact,Virtua has been translated into many international languages to ensure worldwide ease of use. At Klinikum, all discs also include a viewer for display on any Windows platform so that patients can view their medical images as well. Virtua includes several industry-leading viewers, including specialty viewers for functional imaging and digital mammography. While Klinikum uses the Codonics Clarity Viewer today for this purpose, adherence to open standards will allow Virtua to handle even more viewers in the future. Dr. Gärtner notes that many of the referring physicians want to see the four-color, 3D rendered images from MRI and CT studies. "A disc is the only media to transfer the full information contained in the 3D images," he says. Plus, for many clinicians, 3D images are easier to understand than the 2D images that radiologists are familiar with reading, he notes. This is particularly important for patients who are transferred to another facility, Dr Gärtner explains. "We can potentially reduce duplicate exams by sending all quality, high-resolution images with the patient." With Virtua, Klinikum has another marketing tool at its disposal. "We can customize the CD for corporate identity promotions," explains Dr. Gärtner, "and have different contact information depending on the department." The system knows precisely which department and modality originated the order and selects the appropriate customized label based on that information. "This was definitely another reason why we purchased Codonics' solution." Plus with advanced imaging modalities such as CT and MRI, Dr. Gärtner knows there are significant cost savings. He believes that after two years in operation, burning approximately 20 CDs each day, Klinikum will recoup its initial investment quickly. Regardless, after one year in, Virtua has performed flawlessly. Quite simply, Dr. Gärtner says, "This is definitely an ideal solution for distributing images and communicating patient results." Klinikum Garmisch-Partenkirchen is a 505-bed academic teaching hospital for Ludwig-Maximilians University in Munich, Germany. As a major clinical center, the hospital treats over 20,000 patients each year. A team of 1,000 highly qualified physicians, nurses and technologists use the most modern, diagnostic and therapeutic equipment available to provide the highest level of medical care. Klinikum conducts approximately 7,000 CT and 4,000 MR exams each year. For 21 years,Dr. Gärtner has worked as a radiologist and has held his current title as Chief of the CT-MRI Department for the last two years.